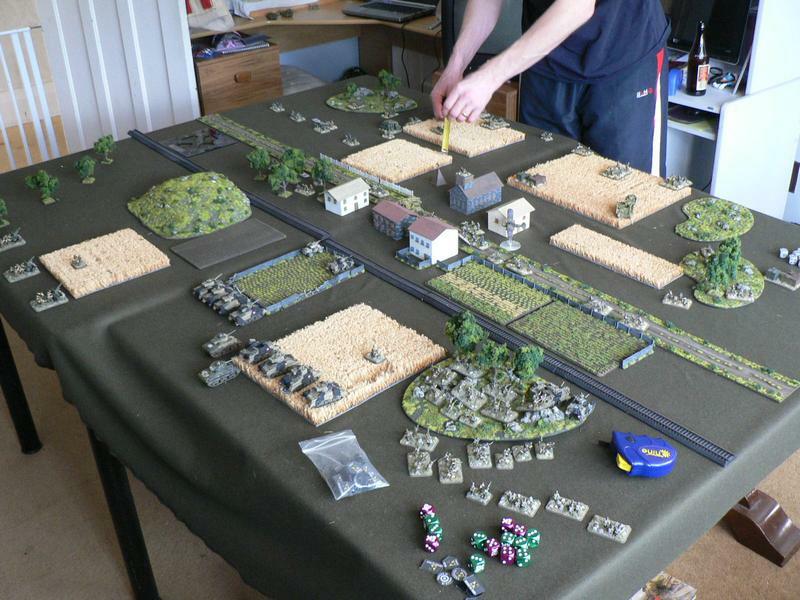 A few afternoons ago Patrick Gribble and I played a game for the WWPD Operation Sealion 1944 campaign (found here...). We chose to fight over Gloucester, a critical point on the campaign map of western England. Aerial reconnaissance of the battlefield. Germans are known to hold the road and the ground to the right. Fighting Withdrawal – Germans defending . 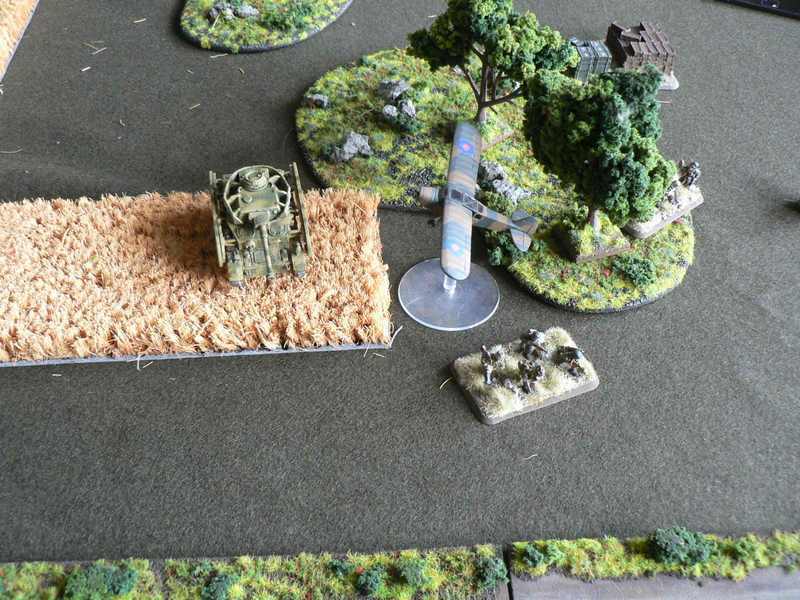 PAK 40 platoon in ambush, 2iC became a kampfgruppe with the panzerschreck and 2 infantry stands. Canadian reconnaissance Stuarts move followed by turn 1 movement. Reconnaissance lifts the Gone to Ground on the northern infantry platoon dug in behind the wall and the HMG platoon in the houses. In the firing that follows, there are hits on both with no effects. 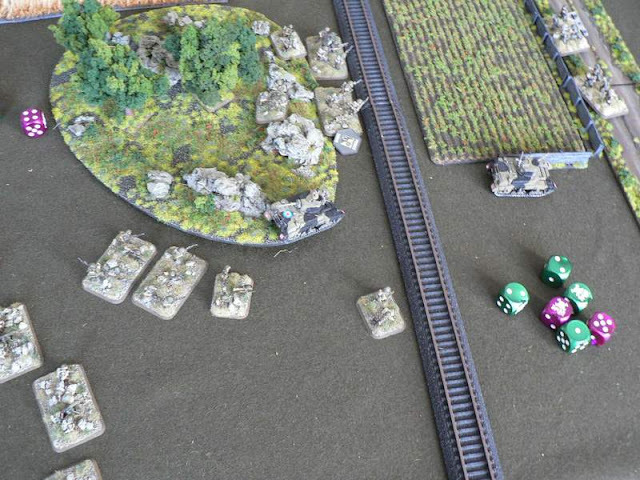 Artillery ranges in on the northern-most Panzer IV and bails it. In their turn, the bailed Pz IV remounts and moves to avoid the ranged in artillery, with another tank in the platoon moving forward to engage one of the Shermans. The Panzer IV platoon fires 6 shots at the two Sherman platoons and destroys 1 tank. The mortars range in on the reconnaissance platoon near the houses and bail one Stuart. 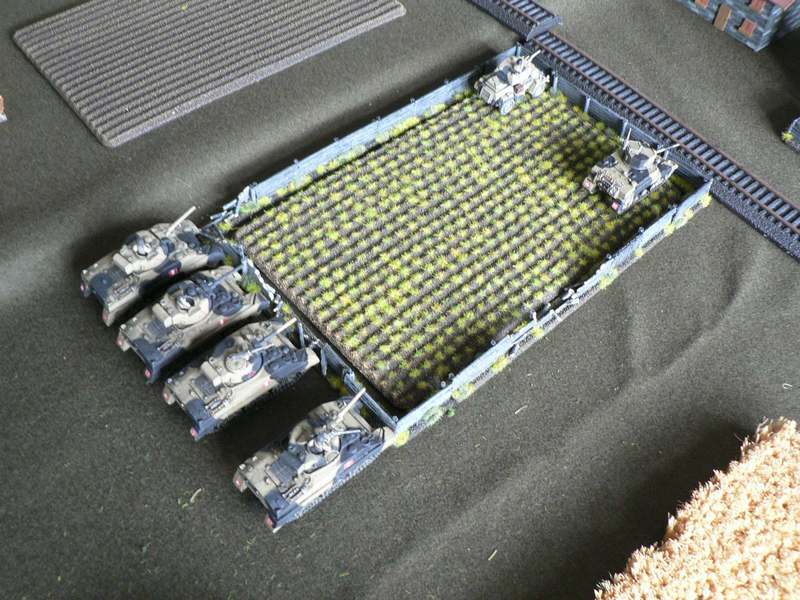 Artillery ranges in on a Sherman that also puts nearly an entire platoon of infantry under the template. The resulting fire kills one infantry stand and pins the platoon. It also scratches the paint on the Shermans. The HMGs also open fire but miss. The Humber armored car is standing in for a missing Stuart III! The infantry unpin and the Stuart remounts. 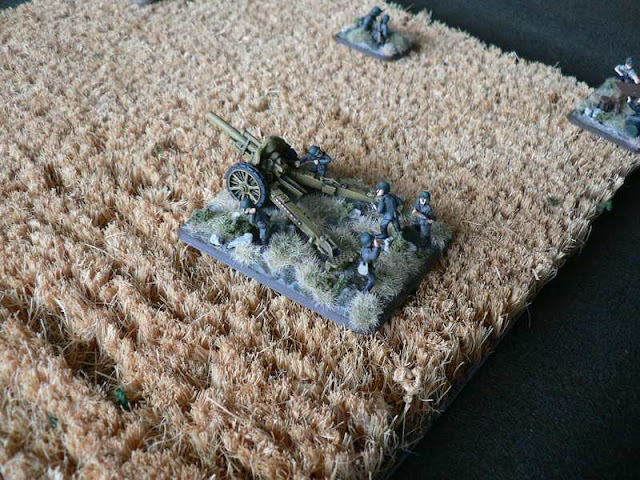 The Vickers guns move up towards the northern German platoon, as do the infantry platoons. In the firing, they destroy 1 stand of the platoon. The 25-pounders range in on the same PzIV but miss. The two Sherman platoons each destroy a PzIV and a third is bailed. 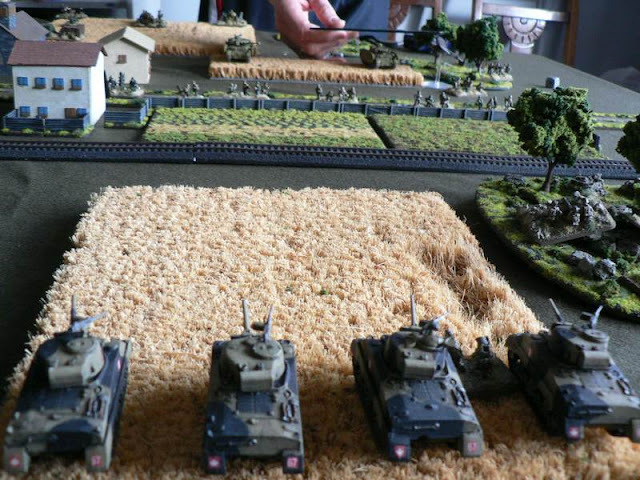 The German tank platoon fails its morale test and runs. The only German movement sees the mortars begin to move towards the battle developing to the north. The firing sees the 10.5 artillery repeat its bombardment, causing no casualties but pinning the infantry platoon. The northern platoon fires at the Vickers guns and claims one stand. 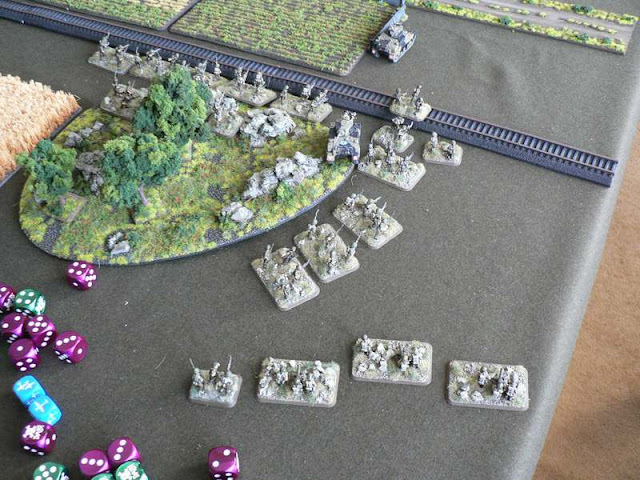 The HMG platoon fires at the pinned infantry platoon and kills a stand. The kampfgruppe fires at the artillery observer but misses, as does the panzerschreck trying to hit the Stuarts in front of the village. The mortars stormtroop. The infantry unpin and continue to move forward. The artillery fails to range in, however fire from both Sherman platoons and the Stuarts in the centre kill 2 HMG stands and 1 stand from the northern platoon. Per the rules for ‘Fighting Withdrawal’, the southern (short) platoon is withdrawn. The mortars continue to move towards the fighting in the north. The 10.5s are still ranged in and manage to bail one Sherman. Everything else misses and the northern infantry platoon Goes to Ground. The southern Sherman platoon moves fast around the hill towards the objective left bare by the earlier German withdrawal. 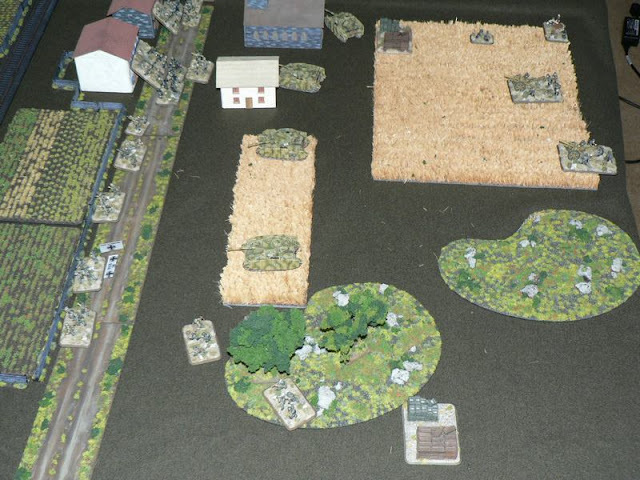 The northern Stuart platoon moves towards the German infantry dug in there, but one tank bogs in the forest. The infantry move up and begin to cross the rail line. The Stuarts reveal Gone to Ground. However, the resulting shooting is terrible. 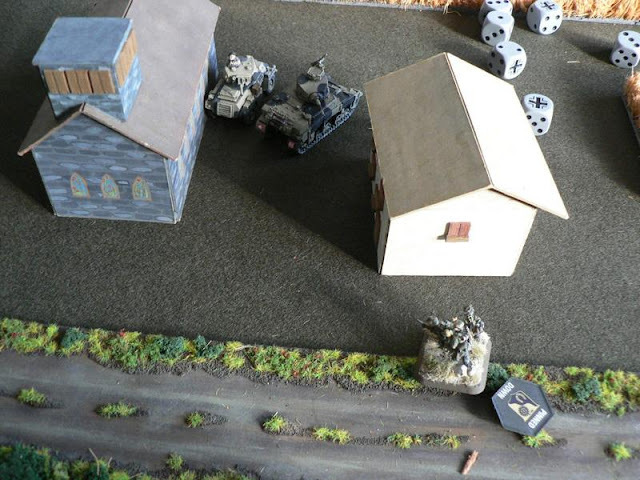 The artillery manages to range in on the kampfgruppe in one of the houses but only pins it. Nothing else does damage. The centre infantry platoon is withdrawn. There’s no movement, so straight to firing. Artillery, mortars and the HMGs all blast the infantry platoon beginning to cross the rail line, killing five stands and forcing a morale check. The northern infantry platoon opens fire on the other infantry platoon moving out from the forest, killing three stands and forcing another morale check. The panzerschreck bails 1 Stuart in the centre platoon. 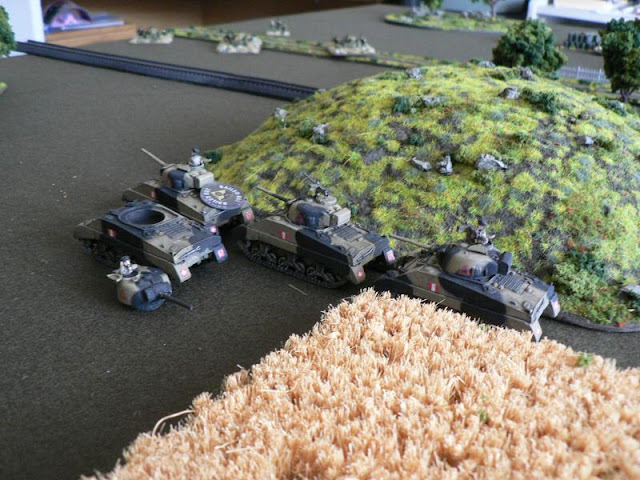 The PAK 40 ambush springs to catch the southern Sherman platoon as it moves out from the hill at the double. The 3 PAKs fire 12 shots, destroying 1 Sherman and bailing a second. 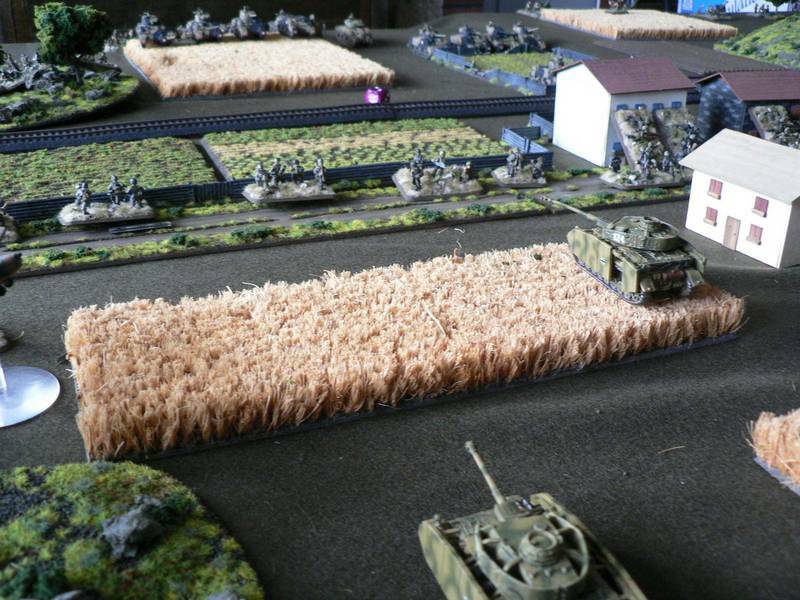 Both infantry platoons fail their morale checks and run. The bailed Sherman remounts. 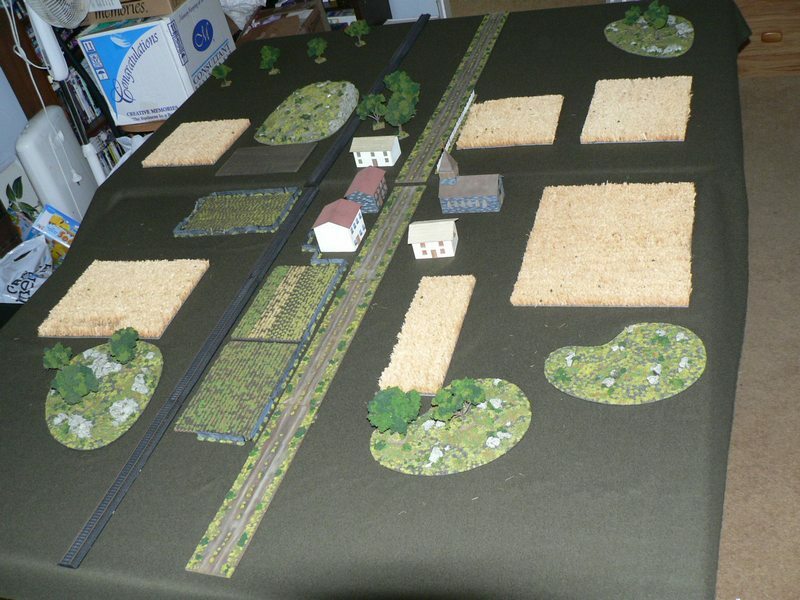 Both Sherman platoons move forward and the northern Stuart that isn’t bogged charges towards the northern objective. Firing results in 1 platoon from the kampfgruppe destroyed as well as the last HMG. The Mortar platoon is withdrawn. The HMG platoon commander passes the morale check but doesn’t pass the ‘Last Man Standing’ check. The German units don’t move. The PAKs bail a Sherman in the nearest platoon, and direct fire from a 10.5 destroys the Stuart on the northern objective. The northern Stuart platoon fails its save and the bogged Stuart is abandoned by its crew. 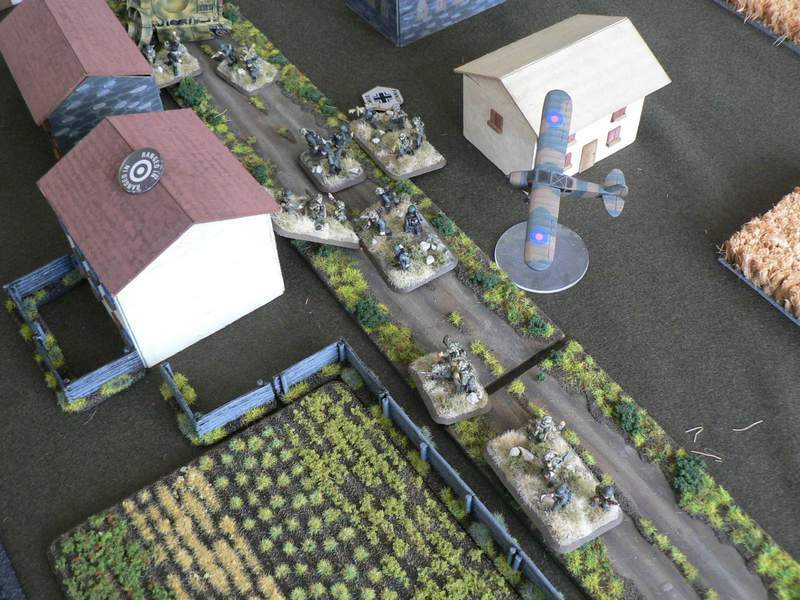 The other Stuart platoon moves up into the buildings. 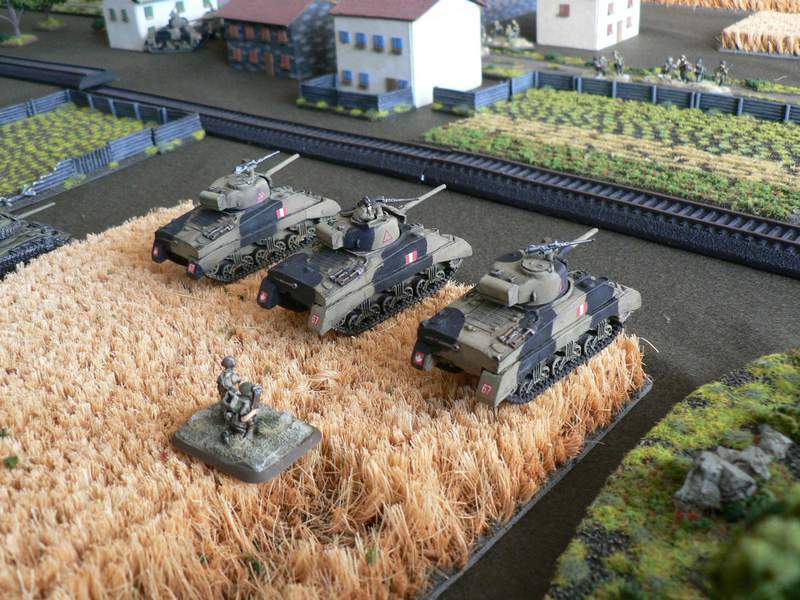 The Sherman platoon near the PAK 40s repositions to target them better. In the firing, the platoon annihilates the PAK platoon while the other Sherman platoon destroys a 10.5. The Stuart platoon kills the CIC and a rifle stand, but a warrior save means he survives. 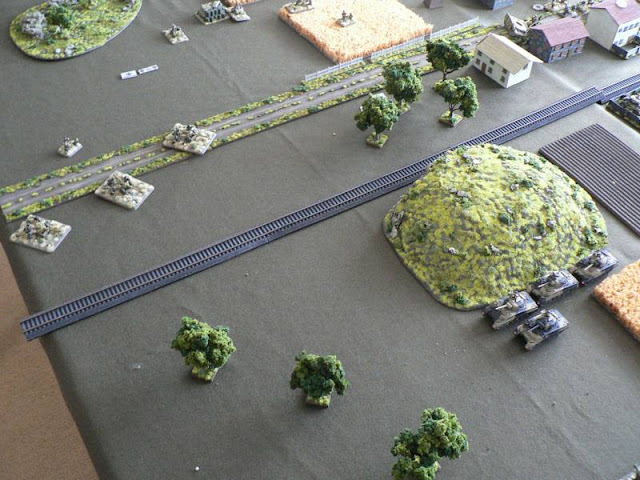 The southern objective is removed. The only German move is the panzerschreck charging the Stuarts, which then misses. Also, direct fire from one 10.5 misses the Stuarts. The Panzerschreck fails the Last Man Standing test and departs. The Stuarts grab the central objective but kill nothing. The CiC and the platoon commander and 1 infantry stand from the northern platoon assault the Stuarts. It’s make or break time! The assault fails, with only the platoon commander surviving. The Stuarts hold the objective and the Canadians take the game 4-3. I like your dice! Represent! Are you testing out that stairgate? The problems with drinking and gaming!